My parents grew up in a much different time. The United States was in the beginning stages of the Cold War and by the time high school graduation was coming for them, being drafted into the Vietnam War was an ever present concern. My parents’ parents served in the military many in their generation honorably did. The focus wasn’t really on thriving during those times but surviving and understandably so. Millennials (myself included) have grown up in a much different world. The only superpower we have ever known is the United States. The US has always been on top and we know of no other reality. Because of generations before us, millennials do not have to try to survive as we assume that we will and can afford to focus on thriving. Psychology was jibberish to me in high school and in college when I took a General Psych course that I was absent about 2/3 the time (no exaggeration). Part of maturing is seeing insight in things that you previously disregarded and psychology has been that for me recently. Not too long ago I was talking with a friend about generational differences and he brought up Maslow’s Hierarchy of Needs. Part of me always hates specific terminology because puts concepts in a box that doesn’t always hold true but in this case the concept is key. 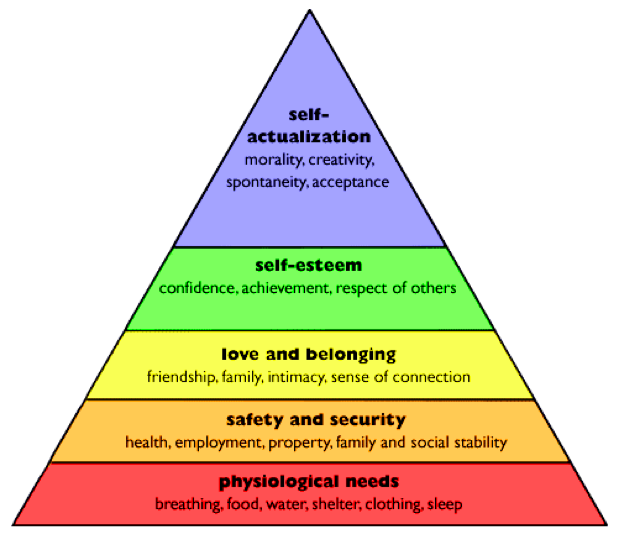 Maslow’s HOA is not that complicated. It simply states that we have personal needs that must be addressed first before we can address any other needs. This is exactly why socially conscious consumers are young and older generations are much less represented in this category. My parents and grandparents grew up in a time where personal needs like safety and providing for one’s family were not given. They had to be fought for. And they did. The prosperity that Millennials enjoy today is because of them and Millennials need to acknowledge that far more than they do. Millennials believe that the rich will always be rich and companies will always be profitable because this is the only world we know. A broader view shows us that we can take these for granted but history is boring (except for people like me). This isn’t necessarily bad though. Because of the security and belief in our own future, Millennials are able to dream and think about how to address others needs. That is a beautiful thing. Millennials apply themselves in areas that previous generations have not. But that is always the case. Each generation sees gaps in the previous generation and does it’s best to fill them. Millennials are no different. Due to technology and increases in income, Millennials are able to be connected to the global poor and social issues like no other generations before them. Yet it doesn’t come as a result of higher enlightenment or evolution. It is the simple process of each generation trying to do the most that they can for the world. Is it much of a surprise that socially conscious consumers are typically wealthier and educated? The poor in the US still care about the global poor but they have immediate needs that must be addressed first and it isn’t selfish of them to think that way. I care deeply about the global poor but I acknowledge that I am lucky to be able to do so. I am not a better person because of that desire. In fact I would argue that my parents are much better people than I am because they sacrificed in ways that I will never have to. This entry was posted in Social Business and tagged Global Poor, Maslow Hierarchy of Needs, Millennials, social enterprise, socially conscious consumer. Bookmark the permalink. ← People Over Profit is more Profitable?